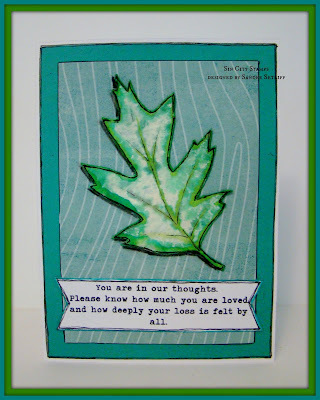 Hi everyone, today I made a sympathy card using Terri Sproul's Leaves along with a sheet of handmade paper and some Tombow markers. I began by inking the stamp with 3 different colors of markers and just before stamping the image I spritzed it with some water. I really like how the handmade paper soaks up the water and ink colors. Almost making it look like a water colored image. I decided to sharpen up the outline a bit by adding a 4th color of green before cutting the leaf out. 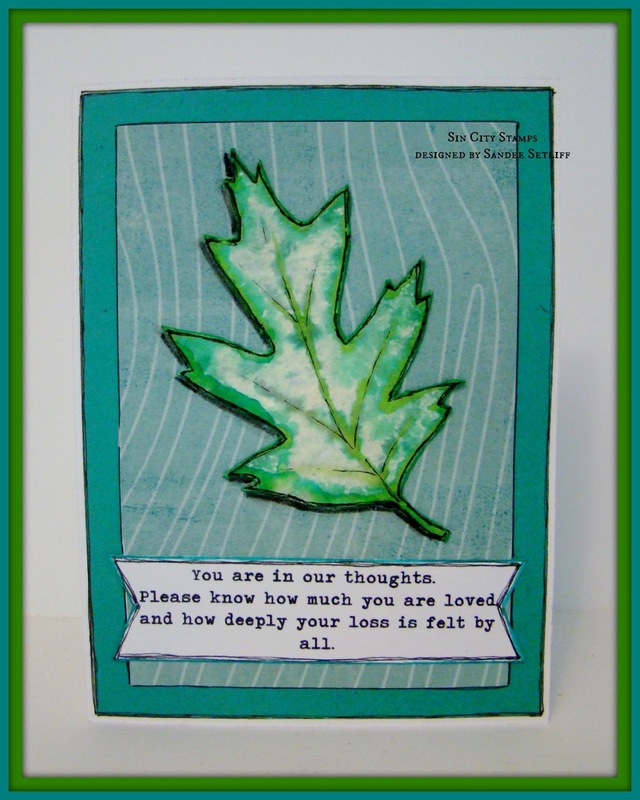 After I adhered the leaf and the sentiment onto my card, I thought it needed a little more pop. Since I used an analogous color theme, often found in nature and to create a serene feeling. Which is what I needed in a sympathy card, but I didn't want it to blend too much so I added some black lines around the leaf and used charcoal to give it a shadow. Fabulous card, Sandee. The dark leaf outline really makes it pop off the page, and you are right about adding the dark lines around the image. Ties everything together. Very pretty!!! Love the green shading of the leaf!